Build a stronger squat and deadlift by focusing on your foot position. Here's an approach that will help you put your strongest foot forward! Feet aren&apos;t often a point of pride. Muscle-bound, barbell-wielding gentlemen don&apos;t often brag about their southern-most appendages. No, it&apos;s "Check out my squat!" or "Hey, dude, I pull 500!" The humble truth is, however, that every impressively demonstrated strength feat necessitates, well, solid feet. Unfortunately, most lifters aren&apos;t training with their two bottom bases in mind. That&apos;s a big mistake. Rather than looking down on them, let&apos;s put the feet on the perspective pedestal they deserve. We&apos;ll examine their impact on leg strength, learn how to position them for performance, and discuss a few basic foot maintenance skills. After procuring this foot-fact composition, you&apos;ll understand why everything starts from the floor. Besides providing the legs with locomotive platforms, the feet play an integral role in strong movement. Sure, most folks think about where they place their feet while lifting, but they don&apos;t often consider their interaction with the rest of the body during exercise. The feet, with their influential muscular contractions, set the tone for the rest of the body, and when their strength is harnessed, the body benefits. Each foot houses 26 bones—a quarter of the bones in the human body. The metatarsals are the bones that give the foot its long, slender shape; between these bones are muscles which help control foot movement and stability. When the middle of the foot strikes the ground, the bones in the foot spread, causing the muscles between them to automatically contract. As the foot muscles contract when your foot strikes the ground, a contraction cascade ensues: The leg muscles of the posterior chain (glutes, hamstrings, calves) reflexively, automatically contract, creating a strong, stable connection between the legs and the ground. This stable connection is the brain&apos;s signal for strength. The nervous system sends the muscles more juice when the feet—and their subsequent reflexive contractions—send the message that it&apos;s safe. Reflexive recruitment from the feet up endorses leg strength ; strong feet promote strong legs. "When your foot strikes the ground, the leg muscles of the posterior chain reflexively, automatically contract, creating a strong, stable connection between the legs and the ground. This stable connection is the brain&apos;s signal for strength." Apart from promoting reflexive muscular contractions, the feet align the legs and hips for movement, especially during the closed-chain weight-bearing of squatting and deadlifting in which the feet are planted solidly on the floor. Here, they&apos;re best placed slightly externally rotated at about 30 degrees. This position creates room for the hips to rotate and allows the lateral (outermost) part of the leg, the posterior chain, and the lateral part of the hip to do their jobs. This position is utilized most effectively by "dialing" the feet. To do this, press your big toe into the ground, then your pinky toe and, finally, finish by driving your heel into the ground. As you complete these three steps, turn your knees out as demonstrated in the video below. This process creates a stable triangle that&apos;s optimal for knee and hip movement. It&apos;s simply called "dialing the triangle." Dialed feet are conduits to strength, accomplishing two ends: they allow the foot muscles to spread automatically, and they optimally align with your knees and hips. Dial while setting up for any lower-body lift before proceeding to the rest of your setup checklist. The "dial-first, everything-else-second" philosophy readies the body for action from the ground up—enhancing lift performance. Maintain the dialed position throughout the lift. We often expand an object&apos;s utility beyond its intended purpose. The ears, for example, are sanctioned to hold your eyeglasses in position. Golf balls likewise share a utilitarian purpose: They&apos;re not just great for whacking, they&apos;re also great for rolling the feet. We jam our feet into shoes, slam them onto pavement millions of times per year, and ask them to support our frame while we squat, deadlift, and press our way into savagery—but we do little to care for them in return. Rolling the feet is a simple way to relax the foot muscles and restore their function. Drop a golf ball on the floor, place your foot on it, and envision mowing grass. Start by gently rolling your foot over the ball in lines moving front to back and side to side. As you can tolerate, increase pressure on the ball. Roll for 30-60 seconds per foot. There&apos;s a high concentration of nerve endings in the feet, which only makes sense since we want to know what we step on, so rolling them elicits nervous system excitation. Foot rolling is best utilized first thing in the morning and during your warm-up. 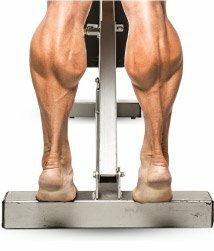 We already have a strategy to apply to the feet during big lifts and one to care for them, so let&apos;s add a strengthening strategy. This strategy is simple: It uses isometric contractions to strengthen the foot muscles. To do it, press your big toe into the ground while lifting your other four digits off the ground. Hold this contraction hard for 10 seconds, then switch: Press your lateral four toes into the ground while lifting your main phalange. Repeat this process 4-5 times, pressing and lifting the toes as hard as you can. Even though we ask a great deal from them, neglect has relegated the feet to a strength position far removed from the rest of the body. They need a lot of input to catch up. Since our feet are denied direct strength training, toe lifts are an all-day, every-day tactic. Do them while you sit at your desk or while watching television. Add them to your warm-up and do them first thing in the morning. Our actions as lifters require that our feet handle multiple stressors. We owe our feet a conscious effort to use them efficiently and care for them appropriately! Dial the triangle before every lift, roll your feet in the morning and while warming up, and do toe lifts throughout the day. Employ these three elements in a comprehensive foot strategy and you&apos;ll build a solid body—from the floor up. Complacency is a death sentence for any training program. Use these methods that create sustainable plans of action to lift, run, and live with purpose! Deadlift performance and lifelong functionality depend on a powerful, stable lower body. Build a stout hip hinge to handle heavy loads with this guide and program! Stop complicating core stabilization with endless crunches and leg lifts. Start using basic lifts that build the foundation of strength and core training!